Chloe Templin, 17, of Lubbock, looks at the cameo of Chris Breen at the Bonfire Memorial Tuesday afternoon. She included the site as part of her visit to Aggieland as a prospective A&M student. 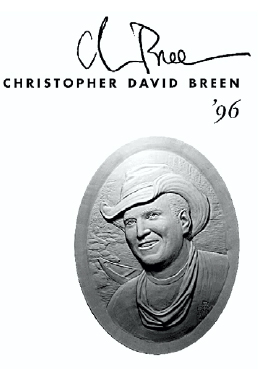 The image of Christopher David Breen, class of '96, is one of 12 bronze portals at the Bonfire Memorial, each bearing the image and name of those killed in the Bonfire tragedy. This is the second in a series of stories about the 12 Aggies killed when the Texas A&M University Bonfire collapsed in 1999. These stories stand in tribute to the lives lost and those forever changed by the tragedy. A ceremony to dedicate the Bonfire Memorial on campus is scheduled for Nov. 18, the five-year anniversary of the collapse. The Breen family could have picked from the letters Chris wrote or words from friends describing his good-natured sense of humor. They could have described their own memories of the 25-year-old man who had a passion for his Catholic faith and an unending love for the outdoors. “This was a prayer that touched us — it was one that all of our boys learned while at camp up north,” Marian Breen said of her four sons, who spent their summer breaks during college working as canoe guides at Boy Scouts of America Sommers Northern Expeditions Canoe Base in Ely, Minn. Chris and his older brothers were Eagle Scouts who explored the wilderness not just in Minnesota, but also in Ontario and Manitoba, Canada. “The prayer just fits there,” Marian said, referring to the site where 2 million pounds of logs crashed to the ground while 70 or so students worked on Bonfire early on Nov. 18, 1999. The 59-foot-high, wedding cake-like stack of more than 5,000 logs was one week away from completion before the annual A&M-University of Texas football game. Chris was the only former student killed in the collapse. None who knew him were surprised to learn he’d been working on the student-run project — even though his graduation came two years earlier, and even though it was a weeknight and work awaited him that day 90 miles away in Austin. While Chris’ three sisters and three brothers — all UT grads — and his father, John Breen, chairman of the civil engineering department at the University of Texas, did all they could to persuade Chris to become a Longhorn, he opted for the maroon and white. And though a renegade to the Breen family’s love for UT, Chris was in step with what defined A&M for decades: He quickly became a member of the Corps of Cadets. In his last year at A&M, Chris’ classmates chose him as the senior coordinator for “brown pots” overseeing the Aggie Bonfire. The leadership hierarchy was notable by the color of pot — a type of helmet — worn on the head; brown pots were considered the second-highest leadership tier and were in charge of the actual construction process. Each year, the pot is passed down to a younger member in the unit, which is what drew Chris — a sales representative working in his hometown — to make the hour-and-a-half trip to College Station on Nov. 17, 1999. He wanted to share in that leadership transition with his Corps buddies. In 11 days, thousands are expected to gather to dedicate the Bonfire Memorial and mark the five years that have passed since the collapse. The Breen family will not be among those in the crowd. The five-year anniversary isn’t any different for the Breen family from the four that preceded it. For them, the loss is just as painful. For them, the tributes are daily. Just as the Breens did when A&M held a remembrance ceremony on the one-year anniversary, they prefer to spend this one at home attending a Mass at St. Austin’s Church — the same place Chris grew up learning about his faith. This year, like every year, there are other dates the Breen family would rather remember, including March 18, Chris’ birthday. And there are places they’d rather visit than a memorial on the site where he died. On the rare occasion the Breens do visit College Station, there’s always a must-see stop — St. Mary’s Catholic Church, which Chris attended. Though scholarships were created in the name of their son, their favorite tribute to his memory is a deck built across the street from the church next to the rectory where the priests live. The Rev. Michael Sis came up with the idea for a deck built under a beautiful live oak tree where students could study, celebrate Mass and have parties. The Rev. David Konderla, a priest at St. Mary’s who has since moved to Austin, was a carpenter before he became a priest, so he volunteered to build it after a student in Chris’ Corps unit designed it. For Marian and John, it’s common for them to choose to do things that remind them of their son. “Whatever Chris liked is where you will find us,” Marian said. While John already had visited the camp in Minnesota where his sons explored the north into Canada, Marian went for the first time in recent years. “Things like that are what keeps the memories alive — it’s a gorgeous place with islands everywhere, and I could just picture Chris out there,” she said of their youngest son, whom Boy Scout officials described as a natural leader. So dear to Chris was his title of “Charlie Guide,” which meant he trained others on how to canoe for up to 10 days without modern comforts, that his family placed in his casket his “Charlie Guide” canoe paddle. He was buried in his Aggie cadet uniform. A picture taken while Chris was on a camping excursion is the one the family chose for the bronze relief sculpture erected at the memorial directly across from the panel with the Indian prayer. His smiling face and rough cowboy-like hat shine back at whoever is looking. “The sculptor did a beautiful job with Chris,” Marian said proudly. Knowing they weren’t coming to the memorial ceremony, the Breens made the trip last month. It was late in the afternoon on a Saturday, before the pair went to Mass at St. Mary’s, when they quietly toured the memorial alone. One thing that visitors will not see at the memorial is a picture of a bonfire, though the theme is centered around what was A&M’s most-revered tradition. Those feelings have been expressed not only in public statements from the Breen family, but in a lawsuit they filed as the two-year anniversary neared. They are among six families of Aggies killed in the collapse whose lawsuits are pending. A trial is scheduled for next year. The Breen lawsuit contends that A&M officials knowingly placed those who worked on Bonfire in danger and calls on the university to be held accountable for the collapse. “It’s not about money — it’s about principle,” Marian said. A commission that investigated the collapse did not place blame with any individual. Rather, it blamed the collapse on decades of poor oversight by university administrators, combined with bad construction. The Breens took their case to the Texas Board of Professional Engineers in 2000, asking it to find A&M — not the students who built the Bonfire — at fault for not properly overseeing such a mammoth project. The state agency found no individual at fault. “One day the lawsuits will be over with and everyone will move on, but we will never move on from our memories,” Marian said. Something the Breen family clings to is the fact Chris had indicated on his driver’s license that he wanted to be an organ donor. Though the condition of his body didn’t allow him to be an organ donor, he did become a tissue donor. Cartilage, bone, tendons, skin and heart valves were removed from Chris and placed into hundreds of people in need. “That’s the ultimate end in generosity,” Marian said. “When I think about those hundreds of people walking around whose lives are enhanced because of Chris, that’s just overwhelming. “He never even told us he wanted to do that,” his mother said. No longer can people note such a wish on their driver’s licenses, but instead those who want to donate their organs are supposed to tell their family members. These days the Breens live the hectic life of being parents to six and grandparents to 11, including two who were born since Chris died. One of the grandchildren was given Christopher as his middle name. “It’s difficult for all of us still, but we have each other and we know Chris wouldn’t want us to be down all the time,” Marian said, adding that some of the toughest days appear out of nowhere. • Kelly Brown’s e-mail address is kelly.brown@theeagle.com.